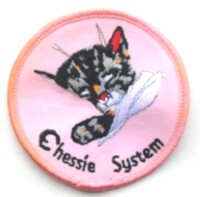 "Chessie" the railroad cat (Chesapeake & Ohio Railway) Patch is a high quality "Chessie" the railroad cat Railroad logo embroidered sew-on patch and can be used on hats and vests. Your railroad patch collection would not be complete without the addition of this beautiful "Chessie" the railroad cat Railroad patch! Our patches are easily sewn on, and high quality for years of use. Chessie was a popular cat character used as a symbol of the Chesapeake and Ohio Railway. Over 360 available to choose from. Size: 3" round. We have photographs and slides of Chessie System Railroads available for sale in our photo shop. The Baltimore & Ohio Railroad, Chesapeake & Ohio Railway and the Western Maryland Railroad.